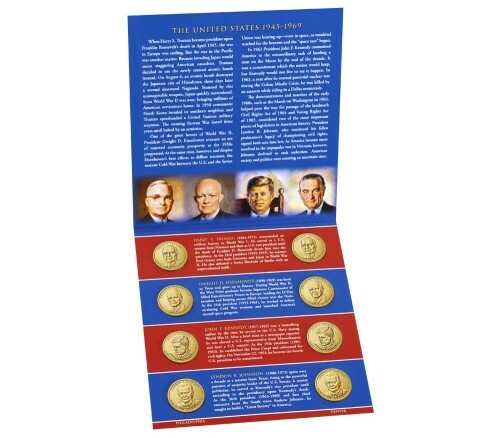 The 2015 Presidential $1 Coin Uncirculated Set has gone on sale today, July 21, at noon (EDT) for $16.95 each. These sets have no stated production limit or per-household buying restrictions and are available for purchase on the U.S. Mint’s website. 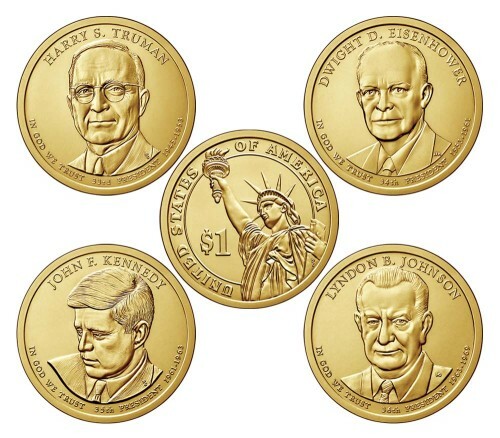 The set’s coins bear the portraits of four mid-century Presidents: Harry S. Truman, Dwight D. Eisenhower, John F. Kennedy, and Lyndon B. Johnson. A total of eight Presidential Dollars are included—one each from the Philadelphia and Denver Mints for all four designs. As with all Presidential $1 Coins, the reverse design features an image of the Statue of Liberty, a “$1” denomination mark, and the words “United States of America” circling its outer edge. The Mint has not placed limits on production or household sales at this time. Last year’s 2014 Presidential $1 Coin Uncirculated Set, commemorating the presidencies of Warren G. Harding, Calvin Coolidge, Herbert Hoover, and Franklin D. Roosevelt, has sold 56,886 units to date.